Aging signs can be unexpectedly shown around the face and neck area from mid-20s to early 30s which will develop with time. Ageing takes its toll in a number of ways, including expression lines, loss of fat volume, loss of bone structure, gravity, and the big one – sun damage. You can’t stop the clock, but, thanks to aesthetic procedures, you can certainly keep it at bay and look as young as you feel. So you want to look younger? You're in luck. 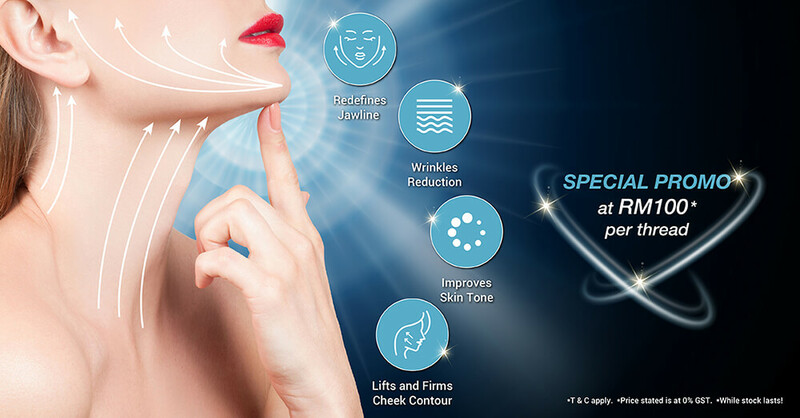 As the leading network of aesthetic clinic, Clinic MF offers aesthetic anti-aging solution with profound experience and expertise, with the latest technique combined with the most advanced and genuine medical devices. The "lunch-time facelift" promises a younger, better-looking you with no surgery, no general anaesthetic and no down-time. What works? What doesn’t? What makes sense for someone my age — and what should be avoided? Here, we explain seven popular anti-aging treatments — almost all under RMXXXX — that don’t require a hospital visit or surgery. The injection of filler materials under the skin can fill in deep folds, such as nasolabial folds (also known as "smile lines" or "laugh lines"), create fuller lips and pad out hollow cheeks and eyes. Falling cheeks and new jowls are commonly caused by loss of facial volume creating the illusion of sagging skin. Though it's not a procedure to be taken lightly, facial filling by a skilled doctor can make a dramatic change in minutes, reversing the sagging, hollow look that slowly descends after 40 (sigh). Rather than just smoothing or tightening skin, they can change the facial profile to a more youthful one. The new and improved INDIBA Stemcell System is a powerful collagen booster that ranges between 6-10 times stronger for quicker cell life recovery depending on individual. As we age, the integrity of cell walls diminishes and our skin becomes wrinkled, losing its elasticity, plumpness and radiance. This optimum enhancement therapy is designed to maximise the skin cell to increase tissue metabolism for bouncy collagen-filled skin reversal process. Feel the instant face lift and baby smooth skin like never before. Also known as the lunchtime lift, Ultherapy is a non-invasive FDA-approved ultrasound device that breaks down and rebuilds your natural collagen giving you a subtle lift and contour. With the use of ultrasound imaging, our doctor can see the layers of tissue during treatment to ensure that the energy is delivered precisely to where it will be the most productive. In fact it is the only device FDA approved for lifting and tightening skin and muscles. The result? Tighter, better-fitting skin, even on the neck. It’s the lift without the surgery! Botulinum toxin (brand names include Botox and Dysport) temporarily "paralyses" muscles when injected. Cosmetically, Botox is most often used to eliminate lines and wrinkles between the eyes, across the forehead, and around the eyes (a.k.a. crow’s feet). After treatment, the overlying skin remains smooth and unwrinkled, while the untreated facial muscles contract in a normal fashion, allowing normal facial expression to be unaffected. Results from Botox can be seen within three to seven days and last three to four months. Designed to be less invasive, it can reduce sagging around the cheeks, jawline, and neck more quickly and with less risk than the conventional approach. 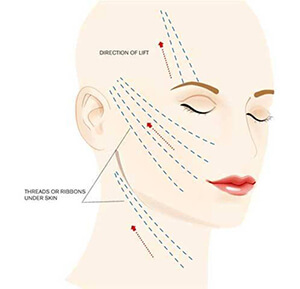 It provides modest and subtle changes rather than dramatic results, people opt to have a thread lift to reduce signs of premature ageing, especially sagging skin on the face and neck. If more than one session is recommended, is there a package available?